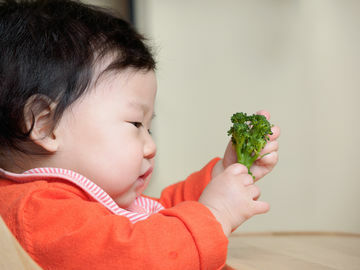 How do you help your baby thrive on a vegetarian diet? Dietitians give us the scoop on how to be a meat-free family. You and your mate may be old pros at making a vegetarian diet work for you. But figuring out how to feed your baby a healthy, balanced, and satisfying meatless diet can seem a little bit trickier. Don't worry: Dietitians say it's A-OK to raise your baby on a vegetarian diet, as long as you're careful to ensure they get the right nutrients. Here's the scoop on how to raise a vegetarian baby right. Is it safe to raise a veggie baby? As with any other baby-related decision, you may find yourself having to defend your choice to raise your baby vegetarian—especially if your family members are more meat-and-potatoes folks. The final verdict? It is healthy. It is safe. You are a good mother (we promise). "It's absolutely healthy for children to follow vegetarian diets," The Baby Steps dietitian, Diana K. Rice, explains. "Plenty of research shows that well-planned vegetarian diets are extremely healthy. Provided that the child is receiving all the nutrients she needs to grow and thrive, there's no reason to delay a vegetarian diet until adulthood." And if you need further scientific proof, take it from the Academy of Nutrition and Dietetics, who released its official stance last year on vegetarian diets, saying: "...Appropriately planned vegetarian, including vegan, diets are healthful, nutritionally adequate, and may provide health benefits in the prevention and treatment of certain diseases. These diets are appropriate for all stages of the life cycle, including pregnancy, lactation, infancy, childhood, adolescence, older adulthood, and for athletes." What are some pros of raising your baby vegetarian? All of those added nutrients in veggies and fruits benefit your baby right now and in the long run. According to Rice, veggie babies (who grow into veggie children, teens, and adults, if they choose) may have lower rates of heart disease and obesity than their meat-eating counterparts. Your growing baby's body will also benefit from eating more dairy that's full of the vitamins their body craves. "Vegetarian children may rely more on dairy and eggs for protein, two of the best and highest-quality sources of protein. Dairy also is the chief dietary source of calcium, so vegetarians that include dairy are less likely to have calcium-deficient diets," Dr. Keith Ayoob, a pediatric dietitian, explains. In addition to having to deal with the naysayers who might raise an eyebrow to your parenting choices, Dr. Ayoob says part of the challenge of raising a vegetarian baby is making sure they're getting everything they need in their daily dietary intake of key nutrients, such as zinc and iron. "You may not need to eat meat, for instance, but you still need the nutrients in meat. Iron is a concern, as meat is a huge source of 'heme' iron—available from animal sources only and the most easily absorbed form of the mineral. There are plenty of plant sources of iron, but they tend to be bound to other compounds and benefit from being consumed with an acid food, like leafy greens served with a vinaigrette," he says. "But, the good news is plenty of kid-friendly foods also are fortified with iron." Rice suggests letting your pediatrician know you're raising your child vegetarian. "It's important information for your pediatrician to have so he or she can keep an eye out for certain nutrient deficiencies." You might also struggle with taste training your baby, and find her reaching for the less-nutritious baby puffs instead of the cucumber you want her to nibble on for an afternoon snack. "Don't think that a vegetarian diet is inherently healthier," Dr. Ayoob warns. "It's what you choose, and you need to choose balanced foods. That can be challenging when you have a child who needs iron sources, for instance, but gives you a lot of pushback about eating vegetables, beans, and whole grains." Ensure your baby gets enough iron and zinc. Fortified breakfast cereals are also a good option, since many contain up to 18mg of iron and 3.8mg of zinc per serving. Make sure your baby doesn't get too full, too fast. A vegetarian diet is often high in fiber—think of all those lentils, black beans, and Brussels sprouts! But fiber-rich foods can cause anyone—your baby included—to feel super-full, super-fast. This may mean that they're not hungry for the other foods they need to balance their diets. "If you have trouble getting your child to consume enough calories, healthy fats, such as avocado and nut butters, are a good way to add calories," says registered dietitian Kaleigh McMordie, MCN, RDN, LD. Even babies will be appreciative of a little spice! Don't shy away from experimenting with various spices to make food more appealing. "Vegetarian foods don't have to be bland, and flavors usually associated with meat, such as smokiness, don't have to be missing from vegetarian fare," Dr. Ayoob says. "Think about adding smoked paprika, garlic, cumin, curry and all kinds of herbs. Introduced early and often, kids are more likely to develop acceptance of flavors." It's probably hard to think about your baby applying to college, or even kindergarten, but one day, they'll (hopefully) be a fully-functioning, tax-paying adult. And when that time comes, McMordie says you have to accept their choice to go non-veggie if they want. "In the case of older kids, it's important to be open to the child's wishes regarding their own diets. Just as I would encourage omnivorous parents to be open-minded about their child's choice to become a vegetarian, I would encourage vegetarian parents not to force this dietary choice on their kids and work with the kids to start following a healthy omnivorous diet if that's what they prefer," she says.